I’ve been drifting a bit again with this blog; not really getting excited about writing an article for you. Part of the reason for this is my own feeling of dejection having been kicked out of Badly Worn Toy after what I thought was one of the best gigs ever. This was the Bank Holiday Monday so I am getting over it now. I won’t dwell on it except to say, ironically, it was my insistence on performing our only original song in a two and a half hour set of killer covers that got me booted out. Well no such problems for The Relics. No they have to face the daily struggle to get anybody to check their music out. The battle to get paid gigs outside their immediate home area. We all do it; a friend posts a link on Facebook to some band that they assure you is brilliant, but do you check it out? Of course you don’t. Life is too short and you might not like them. Well your loss. I would like to think though that, if you are reading this, you will at least listen to a track that I put in the page. So here’s one for you. September Wind is one of seven tracks that are currently set for free download on Soundcloud. There is a range of styles represented within this offering and the band do not easily fall into any obvious genre whilst being readily accessible on first listening. I heard this band while listening to XRP radio and immediately said I liked them. It was on the “Hear This Promotions” show which showcases all the new music sent in to Hear This during the week. Frankly most of it was dreadful, metal bands with brilliant musicians ruined by shouty vocals. So this band stood out in sharp relief. And what a relief they were. 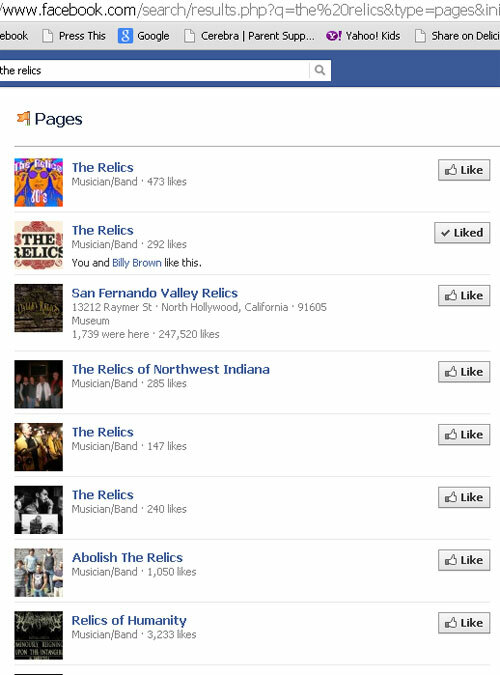 Even “The Relics band” is no good, there are about a dozen on Facebook with the same name. Of course it is too late for them to change their name now unless they get signed to a major, but if you are starting out then you should definitely read my “101 great unused band names” articles with a whole load of useful tips and wry humour. Anyway, I digress AGAIN. 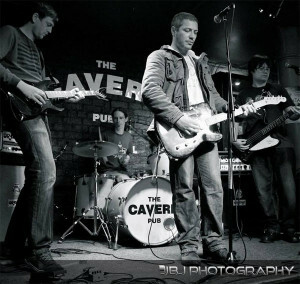 The Relics playing at the “new” Cavern. I’ve played there, but sadly it isn’t the original site where the Beatles played. ‘Imagine if Bob Dylan could sing, was born 40 years later, and was fronting a hard hitting rock and roll band! One of Liverpool’s finest!” (David Bash IPO Festival Organiser). The band have been described as having a “Classic rock sound’, but always with the emphasis on melody. 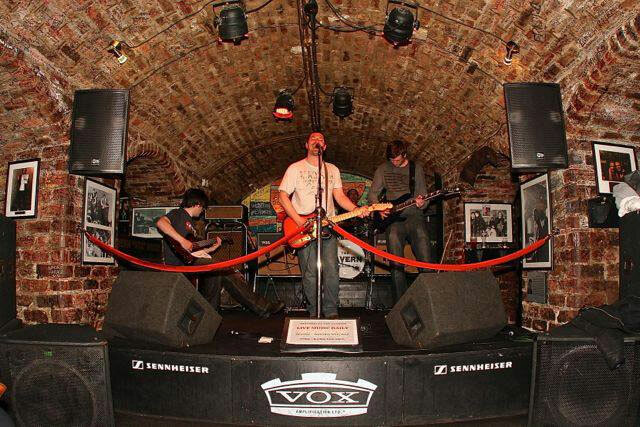 Think of a cross between The Who and REM, with a dash of AC/DC and you won’t be far wrong. The Relics are in the process of recording their debut album “Pilgrim Soul” and gig regularly in and around Liverpool so… keep your eyes peeled. You wont be disappointed!! Now I have to take issue with a few things. but first, here is a video in case you finished listening to the audio sample. He was a brilliant singer who’s distinctive voice still makes my hairs stand on end. But I do get the point of the comment, and I know Dylan would NOT get through an X-Factor audition. Listening to songs like “Song 4”, and even more so on “Rocky Mountain Time” (video) you can certainly hear a hint of Dylan-ness about the vocals. But then I start to think that, if Dylan could “sing” he would sound like Jackson Browne, or for that matter James Skelly of The Coral, a band that jumps into my head for comparison to The Relics. Photo from the band’s Facebook page. I also don’t fully agree with the comparison to The Who, R.E.M. and AC/DC. I would suggest far more the Liverpool/Manchester indie scene, with the aforementioned Coral being in the forefront of my mind, along with Stone Roses, and that sort of ilk. Of course in fairness to the other reviewers, these bands draw a lot of their influences from Classic Rock, and it does depend on your definition of that genre as well. Rolling Stones are classed as Classic Rock in some circles and you can certainly hear that influence in their live version of “Never Again” segueing into “Jumping Jack Flash” I also caught a whiff of The Troggs at one point. In fact The Relics have absorbed influences from every era and every genre of the rock and pop oeuvre, and I appear to have swallowed a thesaurus. The band give their interests as “Playing their own tunes for anybody who wants to hear them” Well I certainly want to hear them and I urge you to give them a good listen. The songs are not instantaneously gratifying, but neither do they take a dozen listens to get into them. I would expect this to be a particularly good band to catch live, although the chances of them schlepping all the way to North Devon seem remote a the moment. You can also find a fair few videos on Youtube it looks like the drummer is the social media brains of the outfit. No jokes about drummers please. There doesn’t appear to be an official website. I’m sorry, I seem to have written a lot of words but nothing really clever or witty. I can’t be brilliant every time. So just go and enjoy the music. Any suggestions as to who I should write about next are welcome. Please leave a comment on here. It makes me feel like I am not just writing for my own pleasure. I thought the article was somewhat disappointing. There was no mention of the weather in Liverpool, now was there any reference to Ian using Pot Noodle (Chicken & Mushroom I hasten to add) as a percussion instrument……they are cheap up North aren’t they! And no mention of how you were introduced….and you call yourself a journalist! Now if you did a decent one on Billy Brown, you may be forgiven. What do you mean, no mention of how I was introduced? You obviously didn’t read all 1,150 words of this ridiculously long article. Yeah true I forgot to mention that Billy Brown promised to introduce me to them that would have made it nearer 1200 words. As for Pot Noodles, I know nothing of this new percussion instrument. And I don’t call myself a journalist. I call myself a self-unemployed jack of all trades. I don’t know….you help people with all sorts…introducing them to quality bands, giving them weather and traffic reports from afar with no thanks…I dunno what the world is coming to anymore! 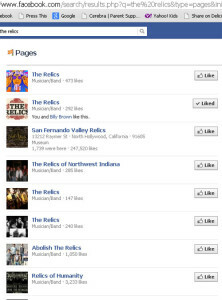 As the lead singer with The Relics I’d like to say I thought it was a good review. By the way I do agree;I think Dylan was an excellent singer, although he’s beyond awful these days, that was the point of view of the guy reviewing us, not the band’s! Hi Anthony. I agree 100% with you there. Dylan made the terrible mistake of growing old instead of dying young! Ha ha ha. And yes you are of course correct it was the view of that particular reviewer and maybe I didn’t make that clear enough in the text. Thank you for your comments. It is always gratifying to know that people do sometimes read it. Oh also; I am SO GLAD, that I ploughed through 149 comments in the spam section manually, instead of just deleting them all. I deleted 148 comments but yours was the only genuine one I found.